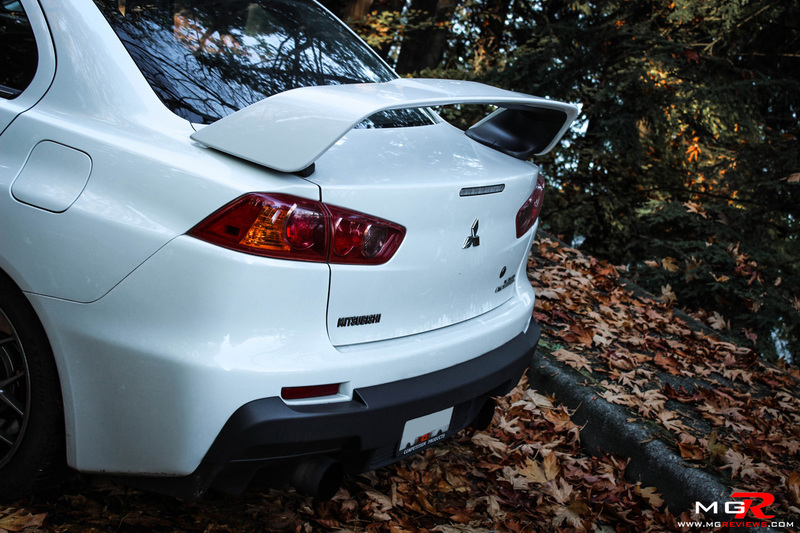 After reviewing the modified Mitsubishi Evolution X GSR a few weeks ago, I was contacted by a member of a local automotive forum who was interested in me reviewing his Mitsubishi Evolution MR and comparing it to the Evo X GSR model. 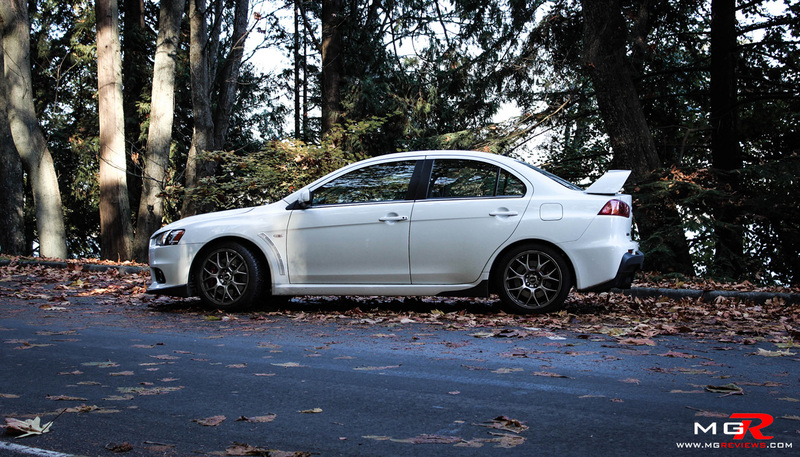 This Evo X MR has a few modifications such as lowering springs and a cat-back exhaust, but for this review I will consider it as a stock production car. 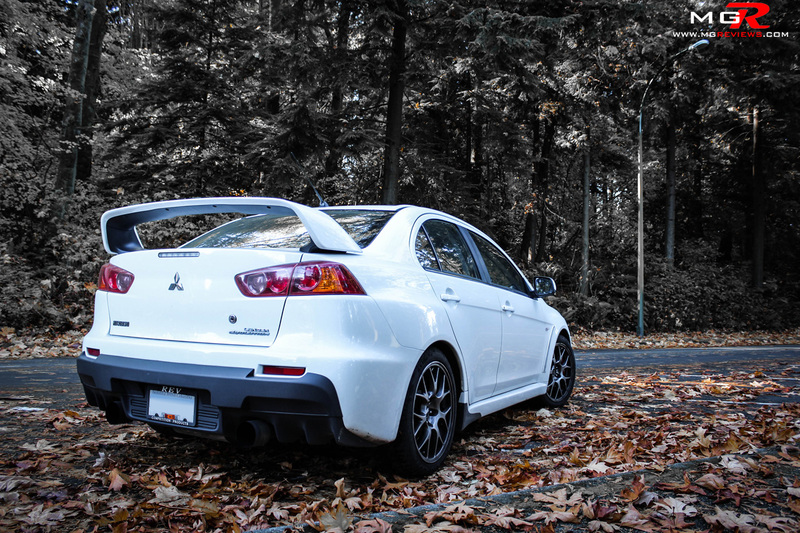 Performance – The engines between the GSR and MR models of the Evo 10 are identical, 2.0L Turbocharged inline-4 cylinders producing 291hp and 300lb-ft of torque from the factory. The biggest difference between the two models is the transmissions they use. The cheaper GSR model has a 5-speed manual whereas this MR model comes with Mitsubishi’s own Twin Clutch SST 6-speed transmission. Thankfully these twin clutch transmissions are becoming more and more popular because they are amazing transmissions. 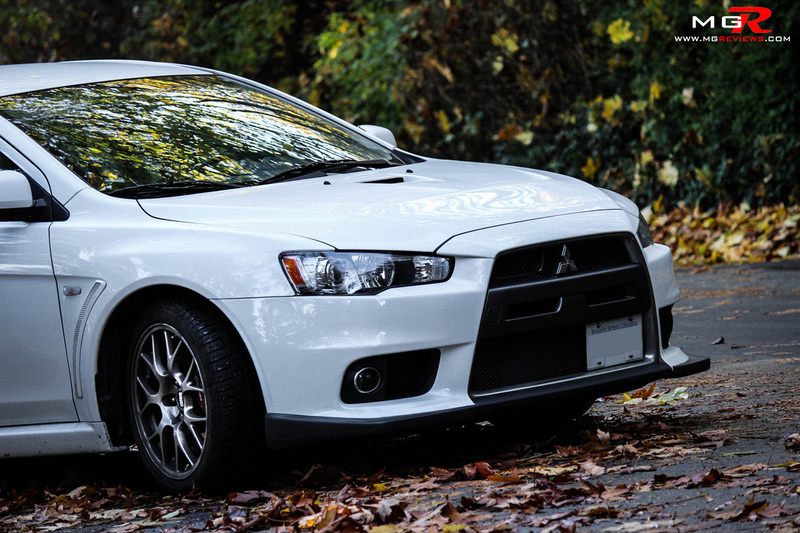 Just like Porsche’s PDK or Volkswagen’s DSG, Mitsubishi’s SST gearbox is lightning quick at shifting all whilst being silky smooth. In normal drive mode, it actually holds the gears for a lot longer than in other twin clutch transmissions that I’ve tested. Now obviously this will not save fuel but I think the computer does this in order to have the engine’s rpms within the boost range. 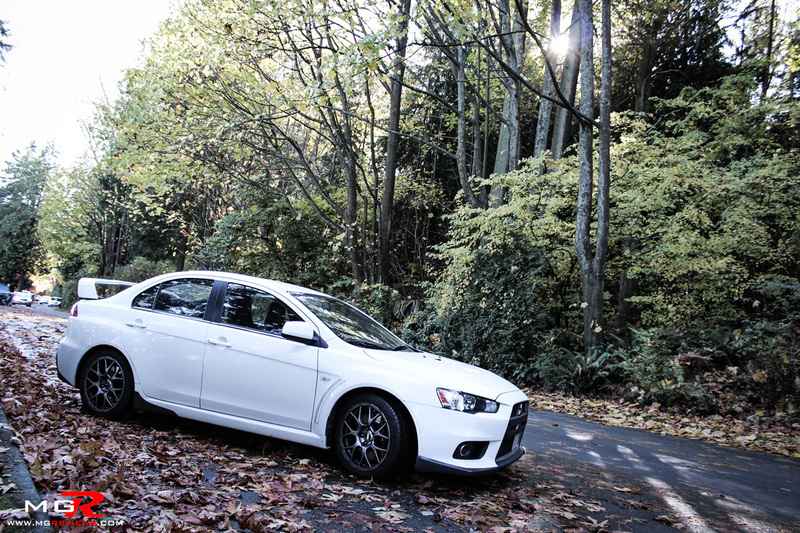 In “S-Sport mode”, the gears are held until the engine reaches its redline but it still upshifts and downshifts faster and smoother than any person can in a conventional manual. 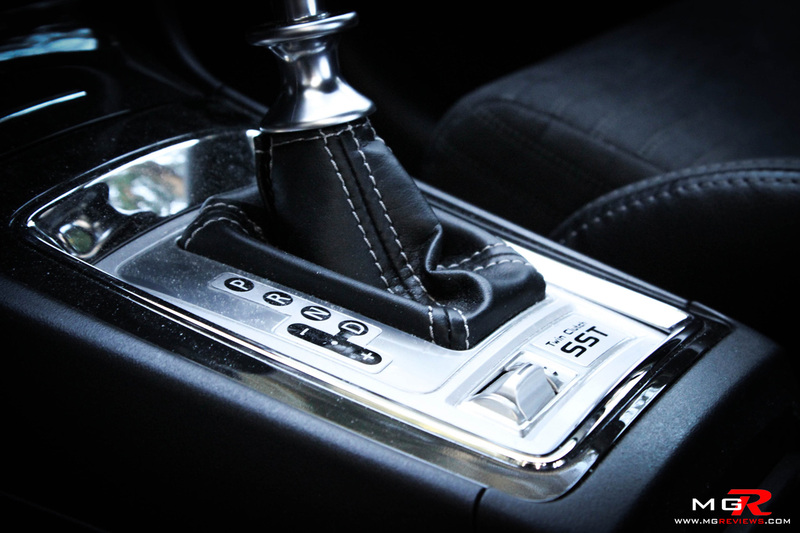 All in all, it’s a great automated transmission but I’d personally still choose a manual transmission over it any day… even in rush hour traffic. I just want to feel involved in the action of driving rather than having a computer do everything for me. 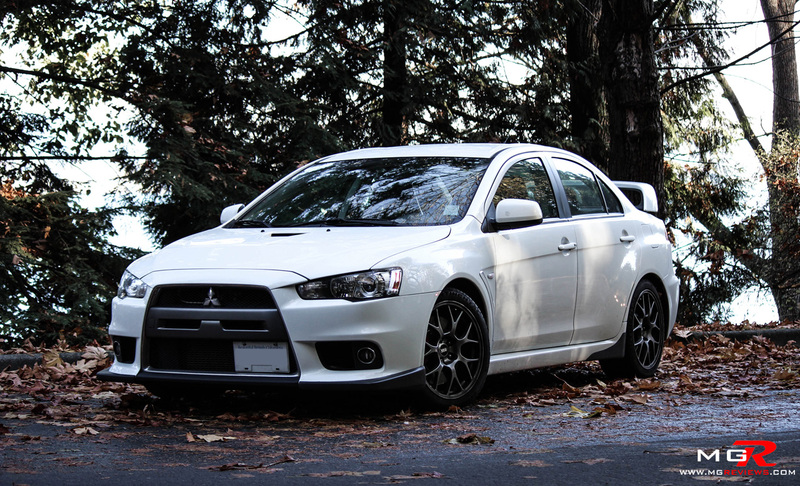 Handling is what rally cars like this one are known for and although this particular Evo X doesn’t have the massive 275 wide tires on all the wheels like the modified Evo X GSR tested earlier does, it will still try to rip your face off in the corners. 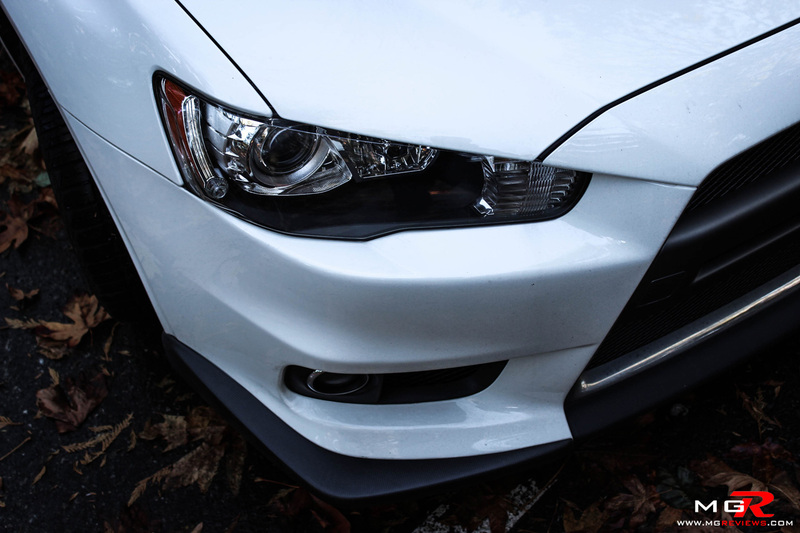 Clever electronics such as Active Center Differential (ACD), Active Yaw Control (AYC), and Active Stability Control (ASC) keep the nose of this car pointing in the exact direction that you want it to go. You can almost go through any corner at any speed and the ECU will sort out exactly which wheel is slipping, which wheel has grip, and which wheels need the power from the engine to pull the car through and out of the corner at maximum speed. All of these systems make the car very safe and very fast but somehow you as the driver don’t feel like you’re driving the car, rather the car is driving you. Comfort – The MR model comes equipped from the factory with upgraded Bilstein struts which not only help improve steering and cornering grip but they are also comfortable for potholed city streets. 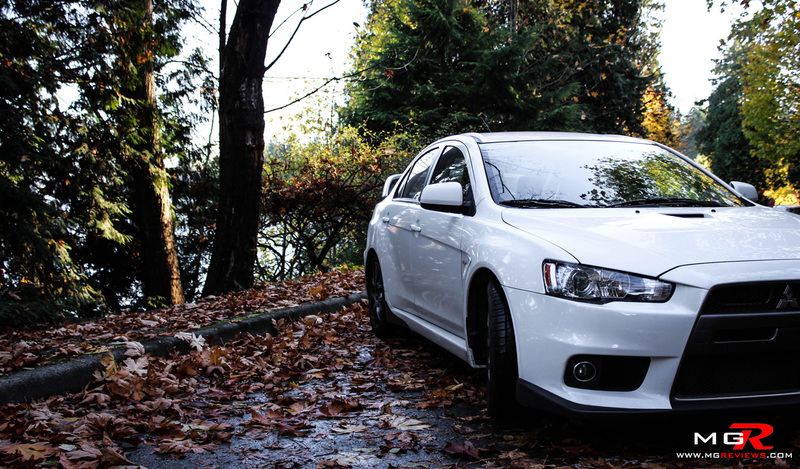 I drove this car for an hour on some of the worst potholed streets in downtown Vancouver and I didn’t complain once about having a “broken back” due to the ride. The fabulous Recaro seats kept me from sliding around whilst going through corners at ridiculous speeds and I just wish more sports cars would offer them as an option even though they cost a pretty penny. 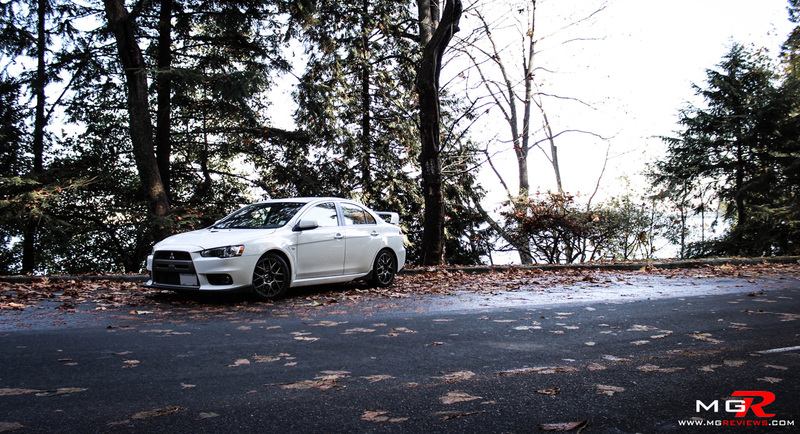 Room in the back seats is… adequate. I wouldn’t recommend sitting in the back for long road trips but for short around the town drives it’s bearable. The trunk space is on the small side though and if you’re a skier or snowboarder, opt for the roof rack because the rear seats don’t fold down. 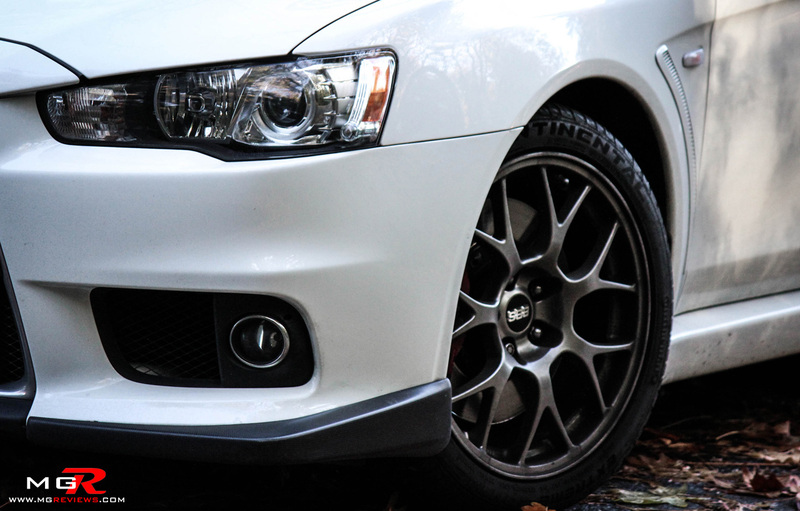 Odds and Ends – One thing I didn’t talk about are the brilliant Brembo brakes. 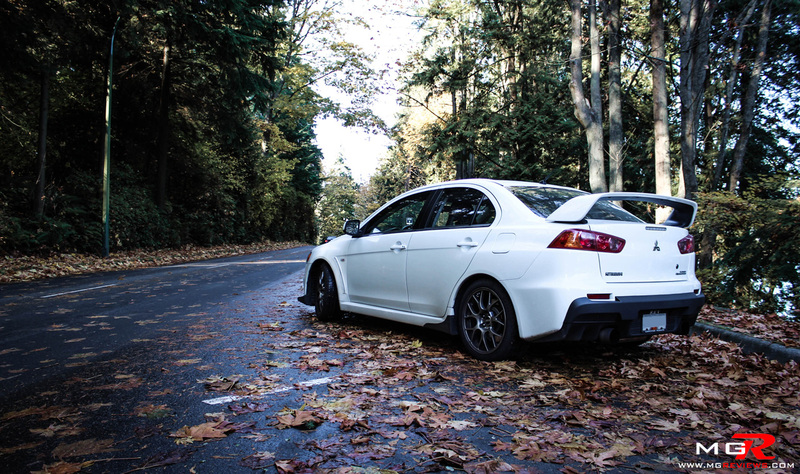 The brakes fitted to this car from the factory are powerful enough to stop this sedan even when it’s been modified to have 600+hp. The MR model has the added benefit of having 2-piece brake discs which weigh less than their GSR counterparts and are less susceptible to warping. Another upgrade that this MR features over the GSR model, are the BBS wheels. These wheels not only look better (in my opinion) but they also help reduce the unsprung weight by approximately 3.5 lbs per wheel over the GSRs Enkei wheels. 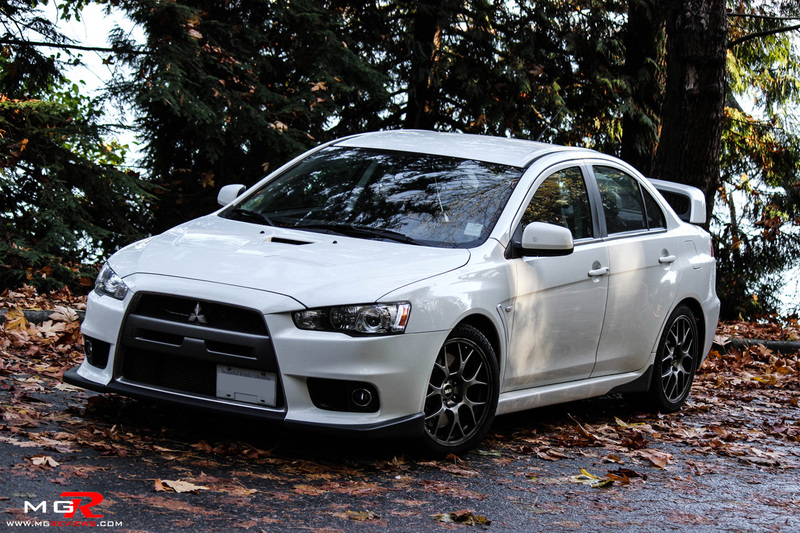 In the end if you’re looking for a sports car but with extra room for family or friends, great reliability, and everyday use, then an Evo X needs to be on your list of “car to buy”. 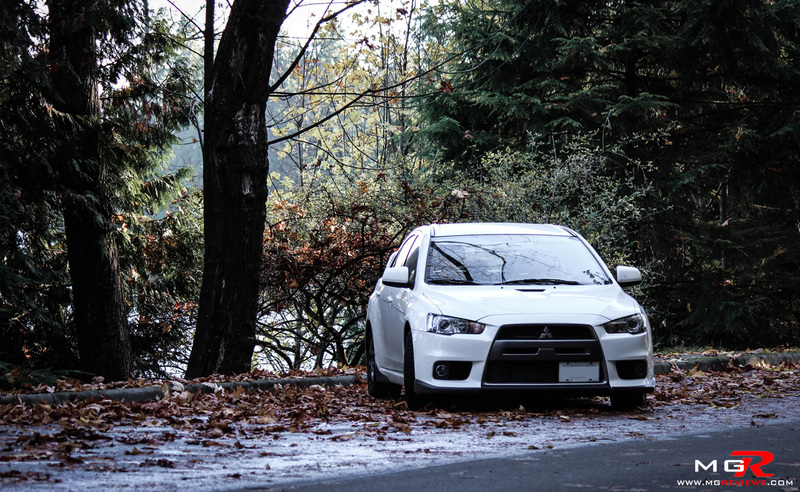 Thank you to the owner of this Evo X for providing the vehicle for the review and photoshoot.